Hello readers! How's your day? Color blocking is one of my favorite trends and I'm dying to try it. Because I used to be a "matchy-matchy" girl, color blocking is really an exciting challenge for me. I love the combination of pink and green because they are complimentary colors and can balance each other out. Thank you for reading! I hope you will have a great week ahead! P.S: I am sorry for the lighting of the photos. I am still learning how to play with camera. 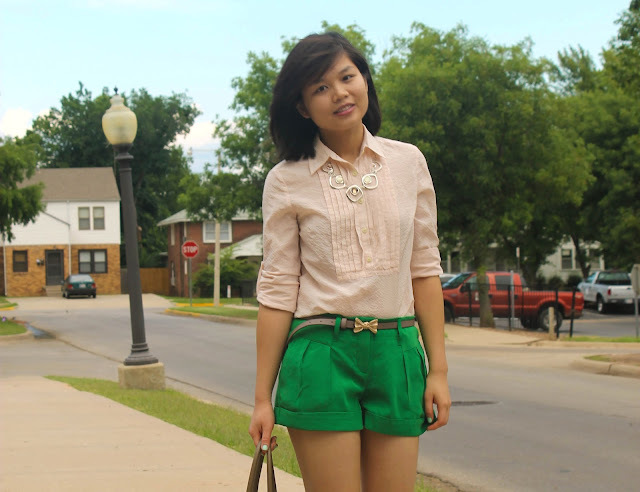 Love the green shorts and bow belt - so cute! Your try worked out so cute! Love your blog, this is my first visit and it won't be my last! Thanks for your sweet comment on my blog :) I am your newest follower! If you liked my blog please follow me, I would like your opinions! Thank you all. I love reading your comments and having a chance to know you more through your blog. so cuuuteee :) amazing color of those shorts! Amazing pics dear! Lovelly blog, would you like to follow each other ? Nice outfit! I still haven't tried out colorblocking. Maybe it's because my closet mostly consists of white, gray, and pink. Not a whole lot to work with! Cute short. Love the color. obsessed with this color combo!! Absolutely love! This outfit is fab, I love that belt! Lovely, your shoes are amazing! Thank you! look forward to seeing your pairings too, Caitlin!